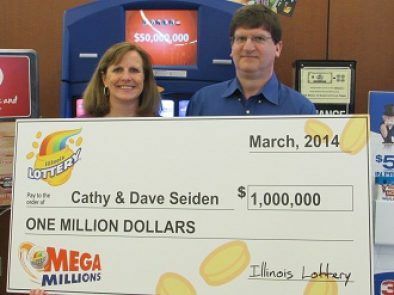 A Downers Grove, Illinois, couple claimed a $1 million lottery prize Thursday after a brief but frantic search for their winning ticket. Cathy and Dave Seiden won the prize after matching five numbers on their Mega Millions ticket for the March 18 drawing. "I looked at my son, and I said, 'Are you seeing the same thing I'm seeing?'" Dave Seiden said. Cathy Seiden is a first-grade teacher in Downers Grove Grade School District 58, and Dave Seiden is part of the technology staff at Valley View Community Unit School District 365U in Romeoville. Their $700,000 lump-sum payment will go toward the college funds for their two children, one of whom is a high school junior. And they plan to keep playing every now and then, as usual. "From now on, all tickets go through me and they go to the magnet on the fridge," Cathy Seiden said. (Click to display full-size in gallery) Cathy and Dave Seiden won $1 million after matching five numbers on their Mega Millions ticket for the March 18 drawing.